We are pleased to have our barn featured on the Great American Barn segment of today's Ag Day broadcast. Besides watching what turned out to be a good game last night, those of us who raise alpacas on our small farms took note of 3 commercials from the game. 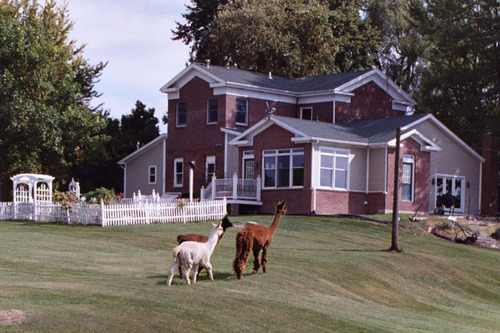 Alpacas were seen (if you didn't blink) in two of those commercials. The Lincoln ad featured a glimpse of alpacas lined up along a fence and the Kia commercial shows an alpaca watching a space launch on monitors at mission control. This was great publicity for the animals we love. 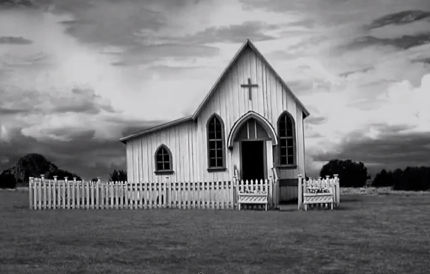 But perhaps the best commercial of the night really didn't look like a commercial. 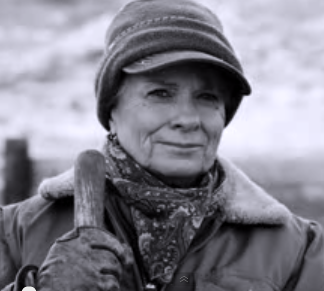 It was a two minute video celebrating America's farmers with beautiful still images and a stirring narration from the late Paul Harvey. Who cares if they were really trying to sell Ram trucks! The imagery was amazing; it was ... art. The two-minute ad featured gorgeous still images from 10 noted photographers, including William Albert Allard, who has long documented the American Midwest; and Kurt Markus, who made his name with his depictions of cowboy life . 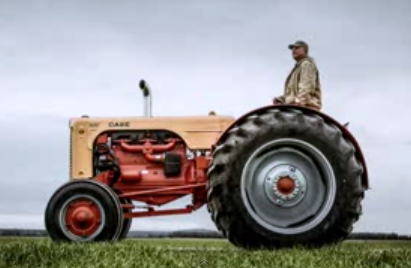 But the most memorable part of the video was Harvey's narration: the folksy cadence of his voice, familiar to any kid who grew up listening to him on the tractor radio in the 1970s and 1980s. He was the superior Andy Rooney and the friendlier News of the Weird. And Sunday night, just under three years after his death, I heard him when I never figured I would: during a Super Bowl truck commercial. But is was more than a commercial. It was the story of our heritage. A story that has nearly been forgotten by today's generations so far removed from the farm. So thank you, Paul Harvey and thank you Ram trucks for reminding Super Bowl fans where their Doritos and salsa really come from. Harvey's essay on the virtues of the American farmer was originally delivered to the Future Farmers of America convention back in 1978. It is as powerful today as it was then. "And on the eighth day, God looked down on his planned paradise and said, "I need a caretaker." So God made a farmer. It had to be somebody who'd plow deep and straight and not cut corners. 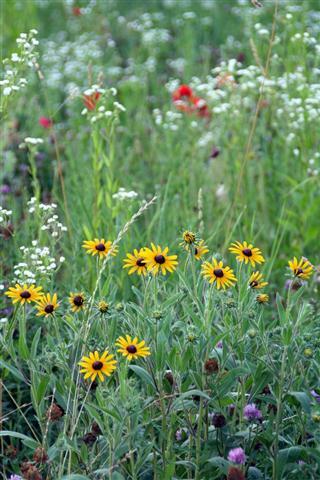 Somebody to seed, weed, feed, breed, and brake, and disk, and plow, and plant, and tie the fleece and strain the milk, . Somebody who'd bale a family together with the soft, strong bonds of sharing, who would laugh, and then sigh and then reply with smiling eyes when his son says that he wants to spend his life doing what Dad does. "So God made a farmer."" 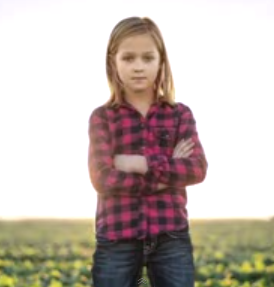 The ad is part of a Dodge Ram partnership with the National FFA Organization (formerly the Future Farmers of America) aimed at "highlighting and underscoring the importance of farmers in America," according to a statement from Dodge parent company Chrysler. 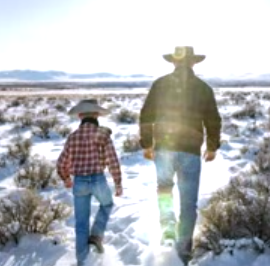 The car company says that every time the ad is watched or shared, Chrysler will make a donation to the National FFA. Grandma Sheets was born 103 years ago on January 13,1909. It's astounding to think of all the changes in the world that have taken place in her lifetime. The first airplane flight at Kitty Hawk was only 6 years before her birth. The Model T was only one year old when she was born. She grew up in a strict home where girls worked hard and weren't given the same opportunity as boys. 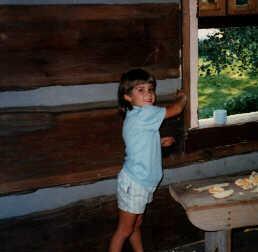 Her father made her quit school after 8th grade so she could work more on the farm. She survived the Great Depression as a young woman and learned the lessons of thrift and savings. Many things changed over her lifetime but she was rock solid. She stood on principle and faith and seldom wavered. Her upbringing shaped her into the strong woman she was. Strong but tender. 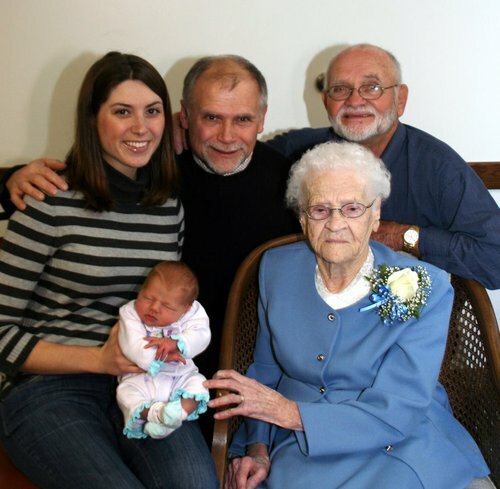 She loved God and family in that order and always put them in front of herself. I spent a lot of time with her and Grandpa when I was a young boy and learned many life lessons from them. Things like how to treat others no matter how mean they are to you. Tips on saving and lending money (do and don't in that order!). She always stressed the importance of good grooming and bought me my first razor when I was in high school. But most importantly, I saw how important Faith and Family was to her and was inspired to model those things in my life. Three years ago she visited Beth and I at the farm for the first time during one of our fall open farm days. She got to see the alpacas we had been talking to her about for years. She felt like a farm goddess riding around in the Gator and sporting a pink John Deere cap. She had a great time, but it was even more important to me that she was there. 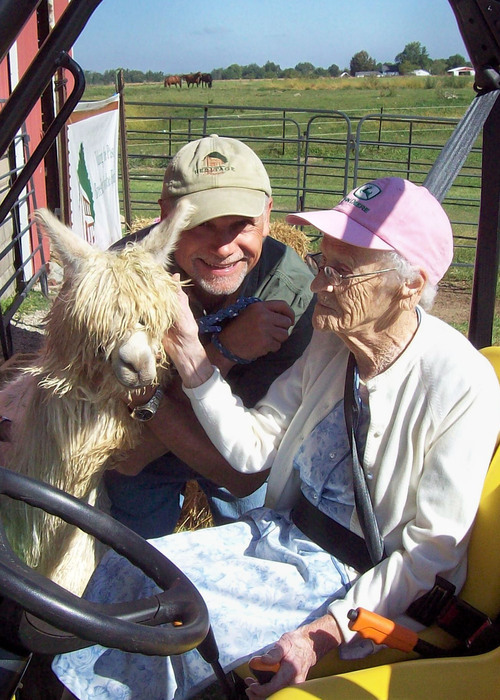 I am deeply rooted in my Christian and agricultural heritage and her presence at the farm validated much of the work we had done establishing our alpaca program at Heritage Farm. 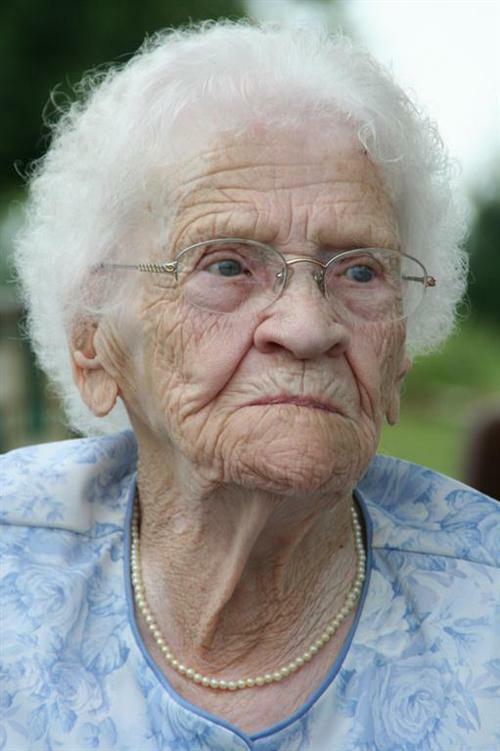 Grandma died this week at 103. She was an inspiration to me and I will miss her dearly but I am truly blessed for having her in my life. The population of Las Vegas, Nevada, was only 30!!! There were about 230 reported murders in the ENTIRE! U.S.A.! I recently came across this book on Google Books. Looks like a great visual resource on natural fibers. Check out the section on alpacas starting on page 360. Take a look at our farm logo at the top left of this page. We chose a rendition of a log cabin to convey our identity. But it is not just any cabin. 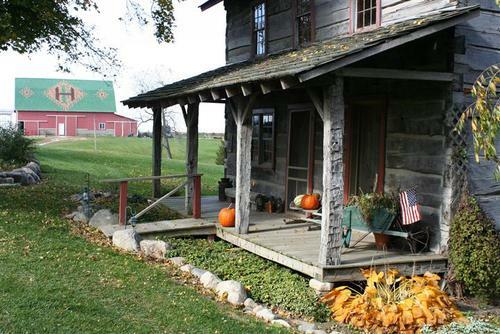 The Lovelace Cabin at Heritage Farm represents a valued part of our heritage. 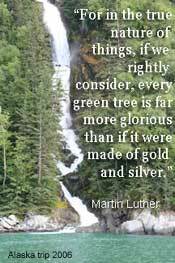 It reminds us every day of our agricultural roots, solid values and the importance of faith and family. 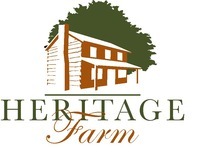 Here’s the story: In 1987, Beth’s parents, Bob and Nelda Lovelace owned what is now Heritage Farm. Beth and Tim live in Indianapolis at that time and were involved in their health care careers. 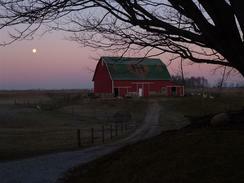 Even so, we would often visit the farm on weekends, longing for a time when we could enjoy the farm more often. One day, a neighboring farmer approached Beth’s dad and told of a discovery he had made. While clearing an old homestead on his property, he discovered that the old white clapboard farmhouse was hiding an antique treasure underneath all that siding and plaster. He revealed the hand-hewn poplar logs of two story log cabin; perfectly preserved by it’s modern coverings. He went on to say that he wasn’t interested in the cabin, and he asked if Bob wanted it. Bob knew that both Beth and Tim were interested in early American History and after a family discussion, we all decided that this would be a great project—something that would bring us back to the farm and provide hours of family time in restoration work! 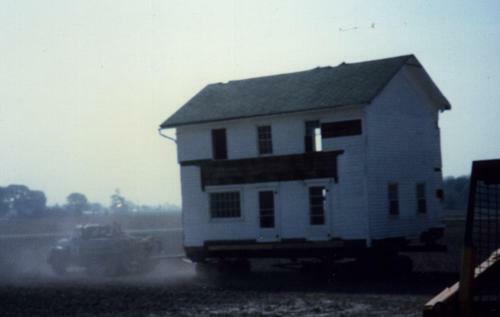 We hired a house mover to move the cabin down 3 miles of country roads to its current location on the farm. After a couple of seasons of restoration, we held our first family Christmas gathering in the cabin. Through the years, we’ve had many more gatherings. 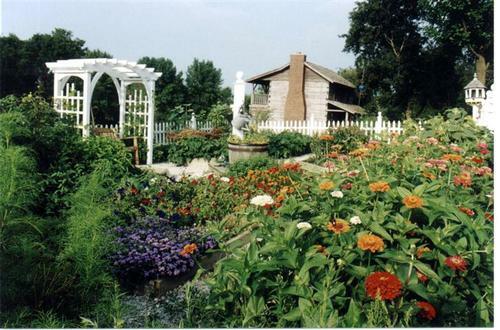 We enjoy sharing with clubs, school and church groups and anyone who wants to experience a little bit of the past and enjoy the serenity of the farm. We are in the process of renovating the cabin again to make it a more comfortable guest house for our customers and boarders to use when they visit the farm. Several time a year we build a big, crackling fire in the fireplace on a cold winter night and just sit in front of it basking in the warm glow of candle light. As the firelight dances off those big old logs, we imagine what it must have been like to live the without the comforts and conveniences we enjoy today. We think about how those families toiled to survive harsh Indiana winters and the hot, humid summers. Families spending all of their time together; parents directly involved in every aspect of raising their kids and instilling life-long gifts of faith and values. We also think about the good times they must have had. They had to invent much of their own fun and entertainment. But they did just fine. And I actually think they were better off in many ways. 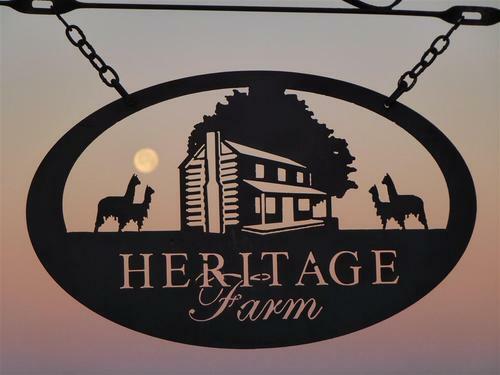 Our mission at Heritage Farm is to apply that same pioneer spirit and value system to our alpaca business. We are dedicated to working hard to provide the best of care to our herd and our boarder’s alpacas. We will selectively breed to the best herdsires and apply new knowledge to constantly improve our herd. And we will deliver the best in education and services to our customers. 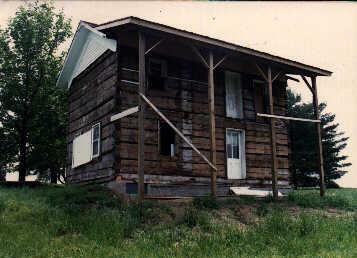 I imagine the original occupants of the Lovelace cabin would have done nothing less. 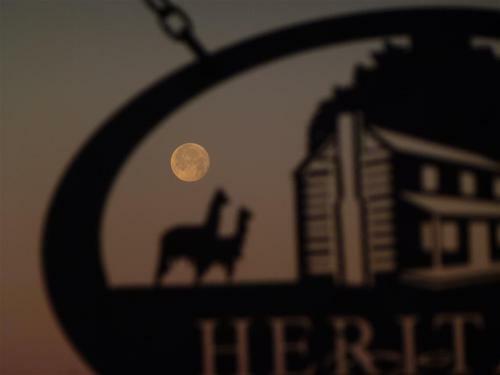 A clear, crisp January morning provided the perfect opportunity to capture the near-full moon setting in the west. 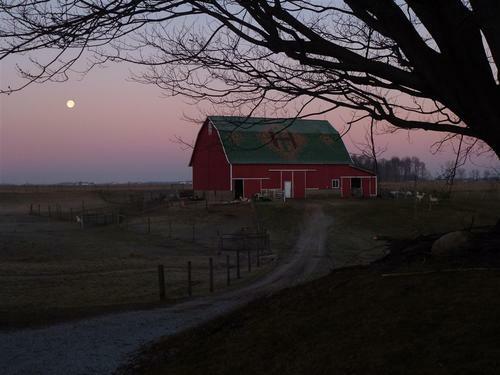 One of the joys of living on the farm is being able to witness scenes like this. Hope you enjoy the pictures. 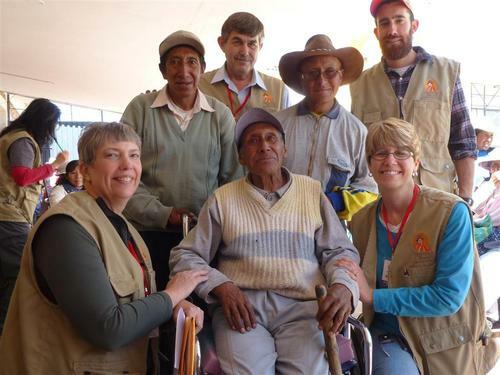 During the first two weeks of November, Beth and I had the awesome experience of participating with the Quechua Benefit Medical Team on a campaign to provide medial services to the people of Peru. 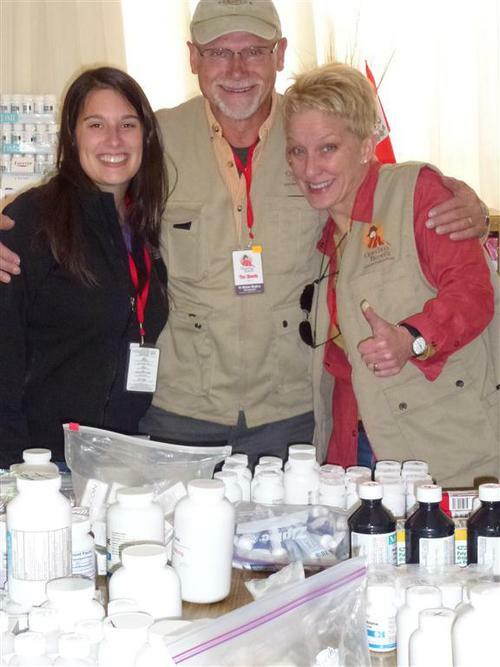 I coordinated pharmacy activities on one of the medical teams and Beth helped with the wheelchair team. 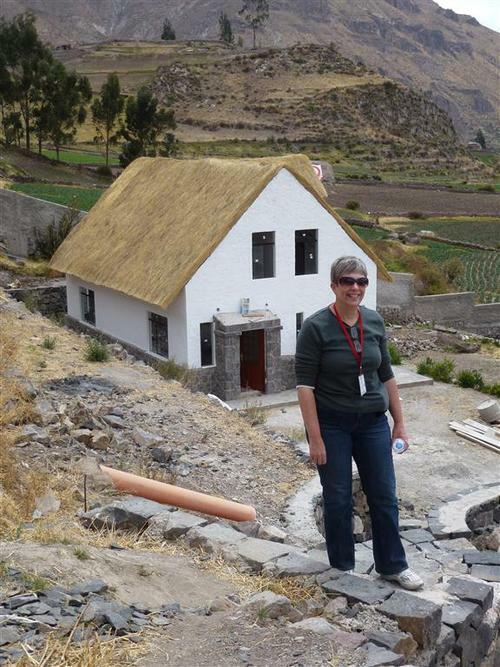 There were over 40 volunteers on this trip making it the largest Quechua Benefit mission trip to date. 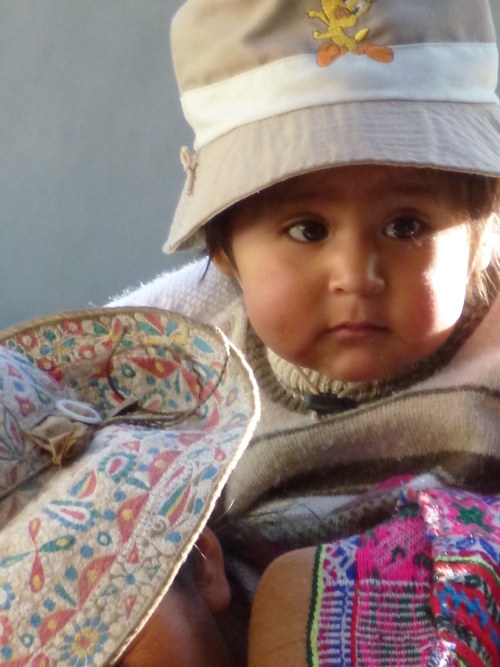 Based in the town of Chivay, the teams traveled daily to villages in the Colca Valley. 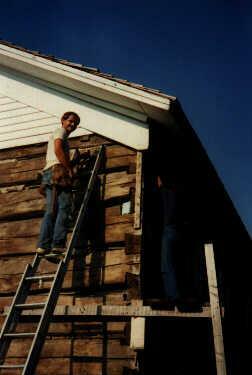 There was also a construction team that built bunk beds at the Casa Chapi boarding school under construction. Our team traveled to three villages, most of which had populations less than 500. One of these villages was the town of Tisco. Tisco was a 3-hour bus ride from Chivay, most of which was traveled uphill on narrow unpaved mountain roads. There were some beautiful vistas along the way. We saw several alpaca farms (estancias), some with hundreds of alpacas. We also passed a mountain lake inhabited with pink flamingos - not something I expected to see. We finally arrived at the little town at 14,000 altitude. At this altitude, just a little exertion made us struggle to catch our breath. It was a beautiful, sunny day; commonplace for that area. I later discovered that the climate stays fairly the same year-round. Daytime highs are around 60 degrees F., but the thin air makes it seem warmer. Nighttime lows are in the 30's except in the coldest winter month of July, when it can drop to the mid-teens. As the bus pulled into town, it looked deserted! I did not see a single person on the streets. I thought maybe we were in the wrong town or arrived on the wrong day! "A man's homeland is wherever he prospers." "Human beings are the only creatures that allow their children to come back home." "And when he cometh home, he calleth together his friends and neighbors, saying unto them, Rejoice with me; for I have found my sheep which was lost." "A house is not a home unless it contains food and fire for the mind as well as the body." "Bricks and mortar make a house, the the laughter of children makes a home." 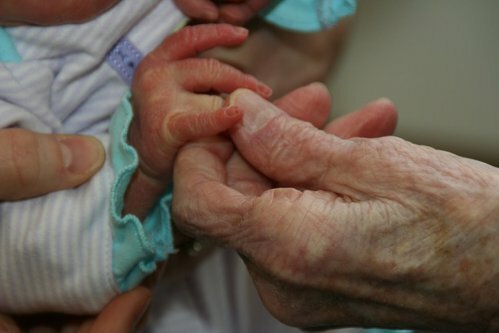 "Love begins by taking care of the closest ones -- the ones at home." "What is a home? A roof to keep out the rain? Four walls to keep out the wind? Floors to keep out the cold? Yes, but home is more than that. It is the laugh of a baby, the song of a mother, the strength of a father, warmth of loving hearts, lights from happy eyes, kindness, loyalty, joy." While hiking around a small lake the other day, I came upon a stand of large cottonwood trees. 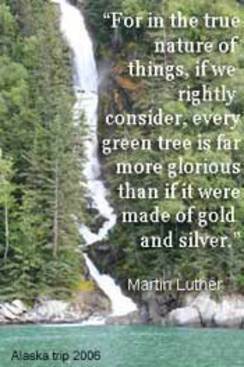 The leaves of the trees made a stirring, rustling sound as they danced in the warm breeze. It is a very unique sound - not easily forgotten - and my thoughts were instantly transported back years earlier when I heard that sound almost every day. 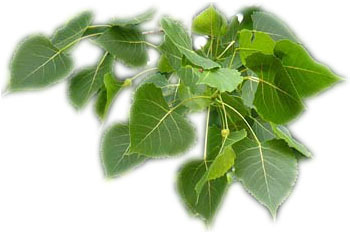 Growing up on the farm, we had three large cottonwood trees in the yard and during those hot summer nights, with windows open, the gentle rustling of the leathery leaves was a sound that often sang me to sleep. Hearing that sound again I was reminded of the fun we had as kids building treehouses and playing cowboys - generally just being carefree! It seems that sounds are often associated with pleasant memories. 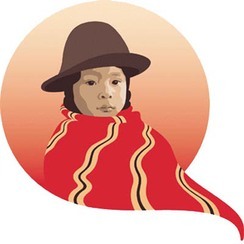 Like a long-forgotten song on the radio that sparks a distant memory, sounds stick with us and become integral parts of our lives, both past and present. 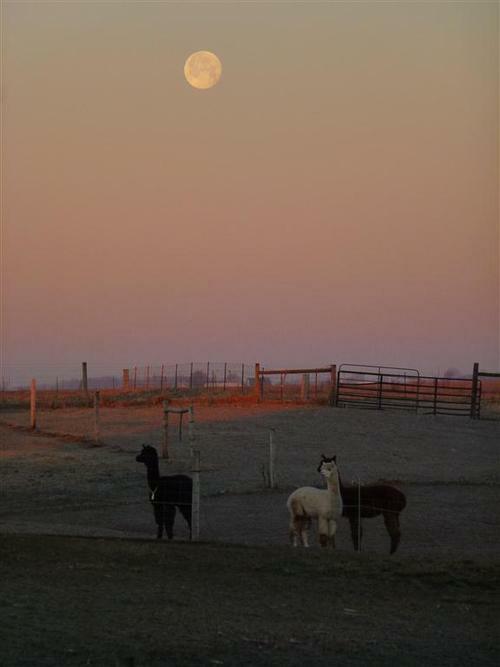 Raising alpacas allows us to experience another pleasant sound...that of the peaceful humming of our herd. Like the gentle rustling of the cottonwood leaves, it's a sound that both relaxes and soothes. It's a sound that reminds us of the gentle, inquisitive nature of these wonderful animals. I imagine that one day, many years from now, I'll hear a sound that brings my thoughts back to this very stage of our lives raising alpacas. I'm sure I'll have many pleasant memories of the alpacas we've cared for and the friends we've made along the way. "The ideas that have lighted my way and, time after time, have given me new courage to face life cheerfully have been kindness, beauty and truth."